It was a year ago this week. Rapper 50 Cent threw out the first pitch at the May 27, 2014 Mets game. And Fitty, aka Curtis Jackson, was just a bit outside -- make that a lot outside! As Mets broadcaster Gary Cohen said, his first pitch "was not great." But it is great as far as one thing -- it always puts a smile on my face! And you know what? 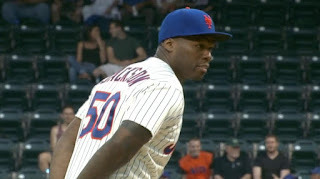 I wonder if 50 deliberately threw this worst first pitch ever so people would talk about him and remember his then-upcoming concert at Citi Field? If he had just done a mediocre first pitch, it would have been forgotten. But with this incredibly bad first pitch, he became a legend! Did you know that Aaron Paul, aka Jesse from "Breaking Bad," was once a contestant on "The Price Is Right"? No joke! Watch him come on down and make it out of Contestant Row. "You're the man, Bob," Paul screams, "You're my idol!" I also like when he screams at the end, "I get to spin the wheel, right?" You know, "Breaking Bad" fans wonder what happened to Jesse after he drove off. I would like to think he was on his way to Burbank to be on "The Price Is Right"! 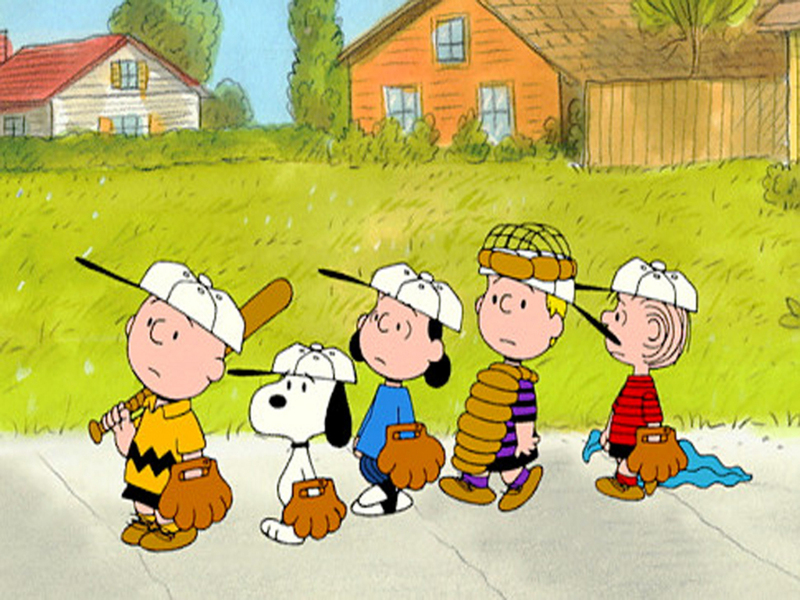 There are a lot of "Peanuts" references in this blog -- I say "good grief" all the time, and both Jon and I reference about the cartoon classics a lot. This clip has the gang dancing to "Hey Ya." It is awesome! My dream is to do a video to act out the dance scene to this music with real-life people. I got dibs on being the curly-haired girl in the back left! You know, Pete Campbell, my favorite character on "Mad Men," had a lot of great comic moments on the show. "Not great, Bob" is a classic. But the clip I love best of him is when he and wife Trudy do the Charleston. It is sweet and charming and funny. Would love to do this in a party in real life! The last clip is definitely not safe for work, due to language. For me, it is also not safe for work because I laugh so hard at it, and cannot stop. It features clips from the Barney kids' TV show with the characters singing and dancing to...N.W.A. 's "Straight Outta Compton"! Subway squabbling: Readers argue about the Mets in our comments section! I am glad I went ahead and put some Mets talk in the blog yesterday. Because it actually got some action going in our comments section. First up is reader RussSharpe, who claims that Mets fans are the real baseball fans of New York. He writes. "I'm a native New Yorker, I've been a Mets fan since 1963 and I've never been a Yankees supporter! There are National Leaguers and American Leaguers, I'm a National Leaguer so I'm a Mets Fan. New York's Baseball history includes 2 great National League teams that both moved to California in the space of a year. One of those teams (Brooklyn Dodgers) broke the color barrier in MLB the other (New York Giants) wasn't far behind with players Willie Mays and Montie Irvin. The American League Yankees on the other hand lagged behind in that area. The Mets are the New York reincarnation of those 2 National League teams, hense the Dodger blue and the Giants' orange logo. That said I really believe that REAL baseball fans in New York are Mets fans because they are not front runners, they just know the game. Mets fans are fans of baseball, Yankee fans not so much." "I'm not surprised more runners are Met fans. It explains why the marathon is held after the baseball postseason, so the Yankees won't be able to distract from the event." "I will never understand why Met fans have this fixation on the National League. Yes, the NL integrated first. It also established the color line in the first place. It established most of the bad things in baseball: The reserve clause, artificial turf, domes, concrete ashtrays that were islands in a sea of parking instead of ballparks, hideous Seventies uniforms, and, of course, interleague play, which never would have happened if the Mets weren't desperate for three extra sellouts." "There is nothing special about the NL. Add up all NL Pennants won by NY teams, and you get 33 - 7 less than the Yankees. New York is NOT a National League town. It is a front-runners' town, and this the Yankees will rule it for many years to come, because the Mets can't see their next Pennant with binoculars." "And the Knicks wore blue & orange 16 years before the Mets, because those are the City's colors, inherited from the Dutch. It has no more to do with the Dodgers and Giants than the Yankees' Pinstripes were designed to make Babe Ruth look slimmer. (Pinstripes didn't do that for David Wells, CC Sabathia, or, now on another New York team, Bartolo Colon.)" Mike has his own blog -- click here to see it! What do our readers think? Use our comments section to speak your mind! 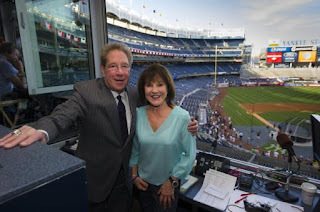 Is John Sterling's home run call for Slade Heathcott his worst ever? One of the things about writing this blog is that I don't ever really know what will strike a chord (or a nerve!) with people, and what will be greeted with nothing but crickets. With a few exceptions, that is! For some reason, anything I write on Michael Kay or John Sterling will generally get a huge number of page views. One of our top 10 all-time most read articles is this piece I wrote in 2012 about Sterling's lame Ichiro home run call. which was “Ichiro, the Yankees’ rising sun, says sayonara." Oy. And my piece on Michael Kay and Jodi Applegate's wedding, which was my second-most-read article ever, still gets page views each month! 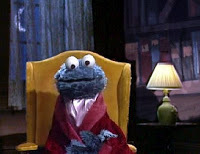 Anyhow, I always say that I picture John Sterling sitting in a smoking jacket late at night, a la Cookie Monster on Monsterpiece Theatre, a glass of cognac on the side, pen and paper in hand, coming up with potential home run calls. But I don't know what the heck he was thinking with his Slade Heathcott home run call. Apparently, Sterling either called it a "heath-shot by Heathcott" or a "heat-shot by Heathcott." Either one is lame. He "Slade" that one; now run, run away! A heat wave from Heathcott! A death stroke by Slade! A hot shot from Heathcott! Heath "Cott" all of that one! And I'm sure our readers will have suggestions of their own. Please use the comments section to give me your ideas! 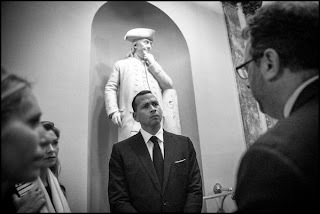 Anyhow, I will be squawking in my (not so dulcet) tones about the state of the Yankees, And if I am asked what the biggest story out of Yankeeland this year, obviously, since I joke that I have a PhD in Arodology, I am going to say that the transformation of Alex Rodriguez from pariah to fan favorite is the biggest one. A-Rod supporters (and Bald Vinny) at the beginning of this spring rooting for him. Now he is the Yankees' biggest star! Yesterday, Alex hit a three-run homer to win the game, and he also is now the AL leader in career RBIs. He has also received more All-Star game votes than any other Yankee besides Jacoby Ellsbury. And he is clearly the fan favorite when it comes to Yankee Stadium cheers. Alex told the media yesterday that the layoff from baseball helped his body heal. But I really also think it helped his mind heal, too. In a way, there is something liberating about hitting rock bottom, the way Rodriguez did. He has no more secrets, nothing to be afraid of. We all know the worst of him. Now he is getting the love he always wanted. And now he is only 19 hits away from 3000. It will be delicious to see the Yankees squirm over yet another A-Rod milestone! Shocker! There is actually some Mets talk today on Subway Squawkers! Now if you consider the average runner as he is compared to all the other runners on a bell curve which includes the slowest and fastest runners in a race, he is most likely a middle-of-the-pack runner if not slower. He or she is very unlikely to win anything at the end of a race except maybe a chance to break their own personal record. This experience of continually “losing” races and trying to overcome a physical challenge naturally builds an underdog mentality in many runners. The NY Mets have often been associated as the underdog team, so many runners can relate to them more than the Yankees. Josh's theory also relates to the idea that hope springs eternal each year, both for runners and for Mets fans. Long story short, Josh did some analytics here, surveying New York runners, and then surveying a control group. While the majority in both groups preferred the Yankees to the Mets, the runners did actually have a pretty healthy margin of Mets fans – 41% -- to the control group of non-runners, which only had 12.5% percent Mets fans. You can read the entire piece here. This blog post confirms for me that everything is a matter of perspective. You see, the people in my running club seem to be very fast to me. Heck, Josh was a pacer for the Brooklyn Half-Marathon for those people running the race in two hours, and has run half-marathons on his own even faster than that. While I have improved a lot as a runner over the last year or so, I am still in the back of the pack. And the only way I am ever going to run a half-marathon in even two hours any time soon is if I take a cab from the starting line to Mile 5 or so in the race! 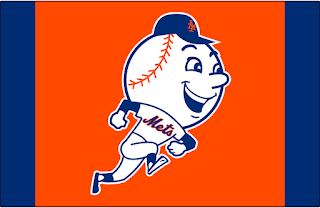 So if *these* runners have an “underdog mentality” and root for the Mets, what does that make me? A Toledo Mud Hens fan? Or perhaps the club below is really the team that matches up to my current running skills. Perspective is everything, and I have to keep on reminding myself when it comes to running to be the best I can be, and not focus on how I compare with others. However, in baseball, how you do against others is what is important. But even then, perspectives are different. My Houston Astros fan friends seem to be absolutely stunned that their team is still in first place, with the best record in the American League. And the Mets still have a better record than the Yankees this year, but you wouldn’t know it from the trash talk (or lack thereof) usually emanating from Flushing when the Mets are doing well. As for Yankeeland, the Bronx Bombers may have just swept Kansas City, and may be back in first place, but many Yankee fans, including myself, are still anxious about this season. With good reason! And here is my perspective. I want the Mets to make the postseason, and I of course want the Yankees to make the postseason. My own perspective is focused on this blog, and both teams being successful will be good for the Squawkers! Yes, I am a solipsist here. So sue me. My night at the "America's Got Talent" pajama party premiere at the Ritz-Carlton, and the talent I have that should get me on the show! So I got to attend the Season X premiere of NBC's "America's Got Talent" tonight. Talk about living the dream! This was a pajama party in the Ritz-Carlton Hotel at Central Park South, and it was a lot of fun. And I am not kidding about the PJ party stuff -- this was held in a swanky hotel suite, and they gave us all bathrobes and slippers emblazoned with the "America's Got Talent" logo. Anyhow, this has absolutely nothing to do with baseball, so I giving you fair warning to bail if you are not interested. But if you are interested in "America's Got Talent" and/or my life, keep on reading! There is also a gratuitous shot of me in bed! better! Newsflash -- I hate wearing dress shoes, whether they are heels or flats. I would prefer to go through life in sneakers, or (even better), slippers! So that was awesome! myself. I just got to fit into the skirt for the first time ever; I didn't want to get out of being able to fit into it! Some of the show's contestants. NBC also had a slew of ways to get into the spirit, with ways to have GIFs and selfies made of yourself. Will post them as soon as I get them! I also tweeted and Facebooked throughout the night, with NBC's hashtags. as Howie Mandel, Nick Cannon, and Mel B from the show working the room. In addition, some of the contestants, including the real-looking boy band Triple Threat and the hypnotist dude, were in the suite. I talked to the hypnotist for a while -- he was the guy who got noted germophobe Howie Mandel to shake hands! The hypnotist, whose name is Chris Jones (he was the guy who looked like Drake!) has tattooed on his arm that he is going to win the Chicago Marathon and finish it in a record time! I thought that was pretty cool, but don't expect any ink from me with any such race promise! A gratuitous shot of me in bed! As for the rest of the suite, I also checked out the swank bathroom at the Ritz. It had a luxurious shower stall, a fancy tub, and a restroom facility with a phone and some crazy buttons on the commode to do all sorts of wacky things that I didn't even understand! I didn't want to have an "I Love Lucy" type catastrophe ensue, so I didn't try them out, though. As for the "America's Got Talent" premiere, I have to say that I really enjoyed the show. It had a great mix of silly and excellent entertainment. The judges have great chemistry, and the pacing of the show was good as well. It will be on my summer list of things I will be watching every week. Even though Howard Stern is on the show, it really is relatively wholesome, family entertainment! Some of the contestants are silly, but most are pretty talented! I admire people who can do things I can't. My voice is horrible, my dancing is no great shakes, and I cannot hypnotize people or be a ventriloquist. There was one thing that got to me, though -- the woman who said she was professional cuddler. Good grief. If that is a skill, then what about my Squawking? Give me a good subject to write about, a laptop, and 45 minutes, and I can write a blog post better than anybody else out there. myself at the end of the night. And yes, I am willing to have a contest on this! So listen, "America's Got Talent" producers. I want to be on the show! I know that watching me fulminate while I type may not make the most riveting TV, but I still contend that my skill is much harder to achieve than professional cuddling! To my fellow bloggers out there, especially the baseball ones, let's do a contest on this! Anyhow, all in all, it was a fabulous evening. Check out "America's Got Talent" on NBC this summer! Pete Campbell's Chip N' Dip! I Squawked Sunday night about New York Post columnist Phil Mushnick's (incorrect) ire over Bernie Williams Night being held the Sunday before Memorial Day. But I didn't write about the ceremony itself. There was good reason for that. That is because I was at the Museum of the Moving Image in Queens on Sunday, checking out the excellent "Mad Men" exhibit (a must-see for fans of the show! 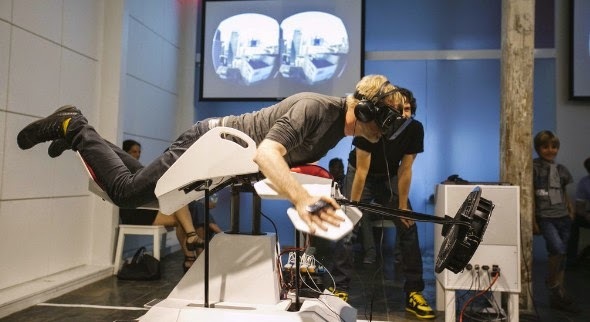 ), and then waiting around for my turn on a customized flight simulator called "Birdly." This thing was awesome -- you got the sense that you were flying over New York City, and you used your arms to flap and swoop up and down, left and right, and over the city. It was a huge adrenaline rush! 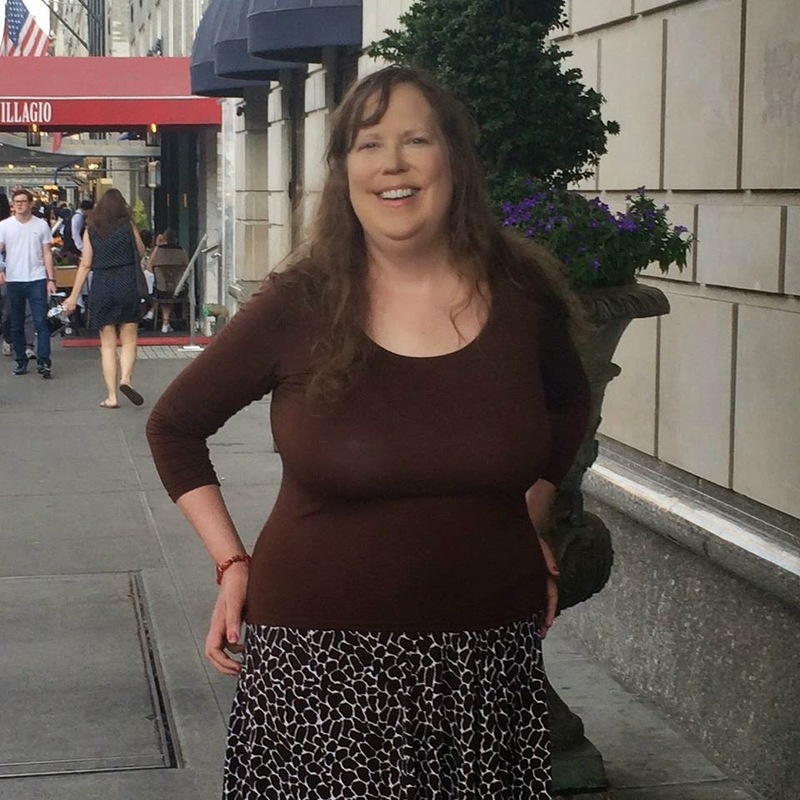 The fact I was not embarrassed to be sprawled out on this thing -- and that I could fit on it -- tells me that I have made big progress on my weight loss goals! Anyhow, I am glad I stayed around to try out Birdly, but it meant that I did not get home to Staten Island in time to watch the Bernie Williams Night pre-game ceremony. However, I was home in time to see that entire debacle of a game, though. Oh, joy! So I didn't get to watch the actual ceremony until this morning. This tribute to Williams, one of my favorite Yankees, was long overdue. And so is this writeup! Before the ceremony, that strange DirecTV ad with Hannah Davis and the horse runs. Given that she is Derek Jeter's paramour, did he get approval on who voiced the horse? Also, this ad isn't half as good as the Rob Lowe ones. Free Rob Lowe! Glad to see Gene Michael here. He (and Buck Showalter) don't get enough credit for the dynasty. If you may remember, when Bernie was a rookie, Williams was shy, wore big glasses, and was teased mercilessly by Mel Hall and called "Bambi." It was Michael who saw this, and got rid of the bad apple that was Hall. Now Williams is in Monument Park, and Hall is in the pokey. Fitting. David Cone is introduced. 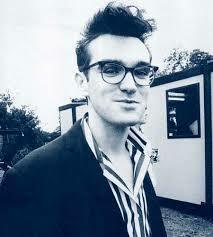 Why doesn't he get love when it comes to the late 90s stuff? Tino Martinez gets a plaque, but not Coney? C'mon now. David pitched a perfect game! Speaking of which, Tino gets introduced as a "fellow member of Monument Park." That just seems wrong to me. Sorry. Paul O'Neill comes out. I wonder if he loses his temper at home, do the light fixtures get destroyed! Come to think of it, I wish he kept that temper in the broadcast booth and gave players -- and Michael Kay -- more grief! Joe Torre is introduced. I know I am in the minority on this, but I feel like he didn't do enough penance over the way he trashed the Yankees both on his way out the door, and in his book. All he seemed to say was, in effect, "blame Tom Verducci" for him biting the hand that fed him for 12 years. Good grief. I notice that nobody, with the exception of Joe Torre, is wearing a tie. Just sport coats, dress shirts, and slacks. Did they plan this beforehand? Is Joe the only one wearing a tie because he was the manager? Oh, wait. Scratch that theory. Mariano Rivera is wearing a tie, too. Derek Jeter is here! He is introduced last, as "El Capitan." One of my brothers has a theory that the Yanks have made a deal with Jeter to retire that captaincy (remember, Brian Cashman said this spring that he didn't think anybody after Derek should be given the role) in exchange for Jeter showing up at these things. Hmmmm. There is a video tribute featuring Williams' career highlights, as well as clips of people talking about him. Brian Cashman says something about how when "we signed him." Um, Bri, you were still in high school when the Yankees signed Williams. The only superstar you signed as a homegrown player was Robinson Cano, who you then let walk out the door. Not that I'm bitter or anything! It was great fun to see those clips of Williams in the playoffs in the late 90s. People have forgotten how good he was in the postseason -- 128 hits, 22 homers, and 80 RBIs! Glad to see him getting the recognition he deserves. I notice in the video tribute that current Yankees like Mark Teixeira, Jacoby Ellsbury, and Carlos Beltran, none of whom played on the Yanks at the same time, are interviewed. Yet Alex Rodriguez, the only current Yankee who was actually a teammate with Williams, is snubbed. Bad form on the part of the Yankees. Stop being petty, guys! Now Bernie is getting gifts. Hal Steinbrenner comes out with a milestone ring. I still contend that Hal looks like a combination of his father and Tucker Carlson! I think it is pretty cool how Williams has this second career as a jazz musician after his first one. And he is very good at the second one, too. Williams is giving his speech. It is a very gracious one, where he thanks his family, teammates, management, etc. He also says that the Yankees wanted to do this ceremony for nine years, and he was the one putting it off. I am not sure when Williams and his wife Waleska divorced, but she is not at the ceremony, although their kids are there. Nor is she ever mentioned or thanked during Bernie's speech. My friend Jerome said that it stuck in his craw that Williams never thanked his former wife and the mother of his children. I have to agree. Overall, it was a very good ceremony, and a well-deserved one. You can watch the whole thing for yourself by clicking this link. I think that New York Post columnist Phil Mushnick frequently makes good points, and can be a much-needed force for good in the New York sports media. This recent column is not one of those times. So the Yankees had to choose the Sunday before Memorial Day, a holiday when tributes are traditionally, logically and respectfully devoted to our war dead, to honor Bernie Williams. Wait a second here. Memorial Day itself is one day -- May 25 (traditional day for it was May 30, but it was moved to the last Monday in May in 1968.) Memorial Day weekend is considered the first weekend of summer. The day before is not the same thing. Not to mention that the Yankees will be commemorating Memorial Day on -- wait for it -- their Memorial Day game! Crazy, huh? I don't understand Mushnick's point here. What about people who have a birthday the day before Memorial Day? Are they supposed to sit around in sackcloth and ashes? ...it didn’t matter to any of the above parties that Williams didn’t serve in the U.S. military, let alone risk his life in combat. And Williams, too, might have known that this Sunday afternoon or night on Memorial Day weekend was not the time to honor him, thus, flattered as he is, the above parties, given that it’s only May, should choose another date. Oh, please. It is not enough to think of the war dead on Memorial Day, but the day before (and the day before that, I presume) have to be solely dedicated to them, too? C'mon now. Mushnick needs to get off his high horse here. Look, I am not being disrespectful to fallen veterans here. As some of you know, my late father was a World War II veteran who is buried in Arlington National Cemetery. And my brother had been in the military for 35 years. He is a lieutenant colonel in the Army reserve serving in Kosovo right now. (He also served tours in Iraq and Afghanistan.) And you know what he was doing today in his free time? Talking about the Yankees with me and others on Facebook. The horror! Some well-meaning people get mad about others celebrating Memorial Day weekend. My philosophy on it is this: these soldiers and sailors died to ensure that we have the freedom to enjoy life. That includes having cookouts, picnics, and, yes, watching baseball games. So if you want to do something to honor those who died defending our country, go to your local Memorial Day parade tomorrow. Visit a local cemetery. Say a prayer. Do some other tribute, if you'd like. (I am running in the Staten Island Advance 4-Mile Memorial Day Race myself, which is dedicated to these fallen heroes.) Go to see the Yankees (or Mets) on Memorial Day and watch the commemorative events. But don't listen to Phil Mushnick. There was absolutely nothing wrong with honoring Bernie Williams Sunday night. Grrrrr. I am irate at the state of the Yankees these days. A little bit more than a quarter of the 2015 Yankees' season is over, and the team is not in a good way. Yes, the Yanks are only 1.5 games out of first place in the American League East, But they have lost five in a row, and nine of their last 10 games, They are only a game over .500. And unless they get a grip -- and soon -- their season will be falling apart pretty quickly. As I noted yesterday, even the YES Network's Jack Curry was suggesting changes to shake up the Yanks. Unfortunately, other than calling up Jacob Lindgren, Brian (Fredo) Cashman seems content to wait out these underachieving players. Joe Girardi, too. Why else would you see a player like Stephen Drew, whose .177 batting average puts him as 173th of 175 qualifying hitters in the majors, batting sixth, as he did on Saturday? Why else would Esmil Rogers still have a job? And why in the world was Didi Gregorius the best choice to replace Derek Jeter? Cashman had many years to find and groom Jeter's successor, and this is the best he could come up with? A weak-hitting player who makes so many mental mistakes? Who missed the cut over this guy? Cashman needs to channel "The Gambler," the classic Kenny Rogers song with the lines about how you've got to know when to hold them and when to fold them. But instead of acknowledging the obvious, not even easy things like giving Drew the old heave-ho, Fredo is staying with the status quo, clapping his hands and believing in fairies. Again. The only reason the Yankees aren't further down in the standings is because they are in such a weak division. And the problems with this team aren't just the players above. Aside from the other usual suspects, like the perennially underachieving Carlos Beltran, can we talk about how overrated Chase Headley is? Wasn't the hot corner supposed to be a power-hitting position? It no longer is in Yankeeland. Headley's splits this year are .235/.289/.379 (.668 OPS), with nine errors at third. His .688 OPS is 18th out of 22nd among qualifying third basemen this year. This is the guy to replace Alex Rodriguez at third? This is the star who earned a four-year, $52M deal from the Yanks after a very mediocre summer in the Bronx? Oh, and Player Y is only costing his team $516,400 this year, while the Yanks are paying $13M for Headley. Want to know who Player Y is? It is Yangervis Solarte, the former Yankee traded for Headley. The Yanks got a player who is four years older, more expensive, and not as good as the person they traded him for. 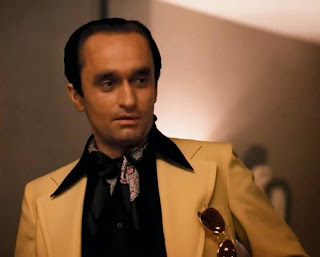 Talk about the Yankee way -- or make that the Brian (Fredo) Cashman way. Good grief. Have the Yankees hit rock bottom? Or could it get even worse? I jinxed CC Sabathia. Let me explain. So I was out and about Saturday morning and early afternoon, doing a three-mile fun run at Clove Lakes Park, going to the farmers' market, buying groceries at Trader Joe's, doing other errands, and chatting with different people I know in the small town that is Staten Island. Anyhow, enough about me. Let me explain how this relates to Sabathia. I finally got home at the beginning of the third inning, when the Yankees were scoreless. And just when I put the game on while I put away my groceries, everything completely fell apart, with CC Sabathia having one of the worst starts of his career, and his worst ever game as a Yankee. ESPN says that Sabathia "is now 0-6 with a 9.42 ERA in his last six Yankee Stadium starts, dating to the beginning of the 2014 season." Yikes! Considering I literally put on the game just before Sabathia's meltdown, I felt partially responsible. Sorry, CC! Sabathia giving up six runs to the Texas Rangers was bad enough. The Yankees bullpen gave up four more runs in the third, and another five in the game, for a 15-4 loss This, after Michael Pineda gave up seven runs in the third the night before in Friday's 10-9 loss. Good grief. Longtime Squawkers reader Uncle Mike pointed out something interesting. Position player Garrett Jones, who pitched the ninth for the Yanks, wears #33. So did Nick Swisher, who once pitched for the Yankees in a mop-up game -- and struck out Gabe Kapler! ESPN noted that Jones was in good spirits after the game, the way Swisher was in that 2009 game. Remember what a snit fit Jorge Posada had after Swisher was smiling and laughing to reporters, whining that there was nothing to be happy about? Good grief. Anyhow, there isn't much for the Yankees to be happy about these days. As MLB.com notes, the Yankees have lost nine of their last 10 games, and their starting pitchers are "1-8 with a 6.61 ERA (37 earned runs in 50 1/3 innings)." This looks like rock bottom to me. Unless it gets even worse, that is. "We got embarrassed," Brett Gardner said after the game. "I feel bad for our fans," he said. "We've obviously looked pretty bad the last week or so." No kidding. Prospect Jacob Lindgren is getting called up for tomorrow. It makes you wonder: can the Yankees end the Stephen Drew Experience for good and call up Rob Refsnyder? Even Jack Curry suggested on the YES broadcast today that the Yanks might want to bring up Refsnyder, and compared it to 2005, when the Yanks called up Robinson Cano. Hopefully, something will happen soon. Anyhow, something's gotta give. Otherwise, it's going to be a long year. Mr. Rodriguez goes to Washington. I was on the phone with Squawker Jon yesterday, and I mentioned that Alex Rodriguez was over at Capitol Hill. Jon's flippant response: "What? Is he having to testify?" 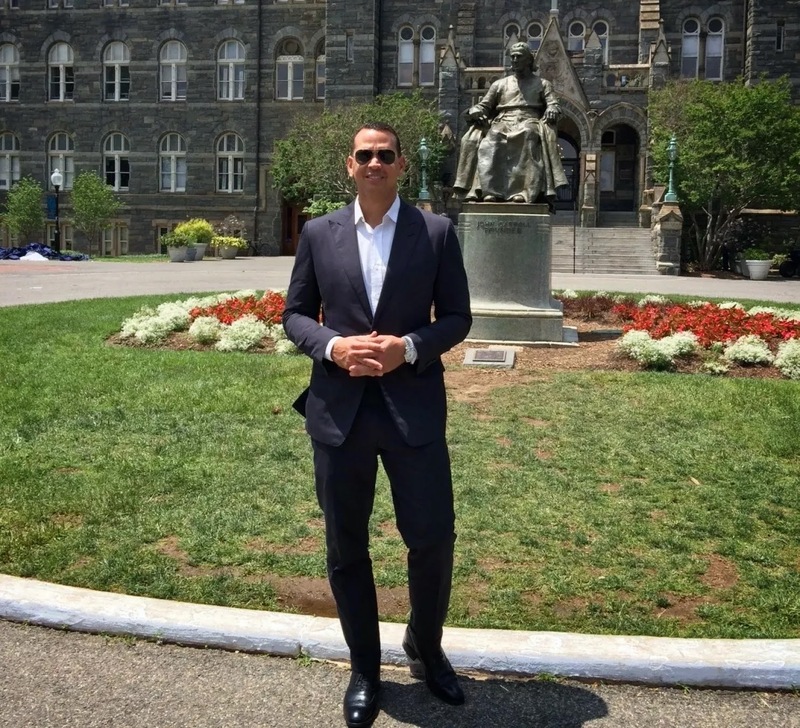 I said that A-Rod was trying to be a better person, expanding his mind and visiting historic places (Alex also went to Georgetown during the Yankees' time in Washington, D.C.) To which Jon said: "If A-Rod is trying to be a better person, watching Congress isn't the way to go." Heh. Incidentally, Jon is also mocking me for making a reference to "Doctor Who" and talking about the tartlette. But I digress. The article has a bunch of stirring moments, and him visiting 40 (!) college campuses over the years to soak in college life was especially poignant, and made me appreciate my own college degree more than ever. These sentences really struck me: "Readings and lectures and bookstores are his guilty pleasures. Especially bookstores. You can go in, he says, have a cup of coffee, and for an hour or two pretend you're smart." No wonder he has been so easily led by people who don't have his best interests at heart -- because he doesn't trust his own brains. Who knows? Maybe he will go back to college and get a degree when he retires. It is never too late! Change is hard. It can be much easier to stay the way we are, even if it means we are stagnating by doing so. But change can also make us better people. Personal growth is a good thing! I know this from personal experience. It was easier for me to stay fat and eat whatever I wanted and go home at quitting time instead of working out, as opposed to exercising and losing weight. It was only when staying the same started to have real-life repercussions that I got off the couch. And making the changes I have had to do in my fitness journey has been a struggle. For example, the other night, I did speed work on the track for the first time ever. It was an event my running club does every Tuesday, and it was the first time I had the guts to show up. I was terrified to go. Putting myself out there on display, when I am still as slow as molasses and not fit and trim the way they are, was hard. Plus, I still can't make it around the track without having to walk for part of it. But I did what we were all supposed to do -- running three laps on the track, doing a recovery lap, and then doing the cycle again two more times. I still had to walk part of it, but I was able to move faster than I ever have in my life, short of sprinting for the Staten Island Ferry when the 1 train was late. I felt like I was going to throw up, but I did it. When I finished, I felt completely exhausted, but I had a big smile on my face for the rest of the evening. That's what I have to keep on reminding myself whenever I get scared in this fitness journey -- how good I will feel when I do something that I didn't think I could do! One other personal note: in case you were wondering, my weight loss has accelerated since the Guideposts article. Now that pretty much every single person in my life, including everyone in my workplace, knows about my weight struggles, I really can't afford to slip up! No! Why did it have to be Ryan Zimmerman (again!) with a walkoff against the Yankees? Here is today's edition of "Behind the Squawkers," and it relates to last night's horror show against the Nationals. Cue flashback music. It was way back in June 2006, the first year of this blog. Squawker Jon and I had gone to Washington, D.C. to visit my brother, who lived in Arlington, Virginia then, and to watch the Yankees play the Nationals. The weekend was a bit of a nightmare, as it always has been for me whenever I have driven in the D.C. area. Between towed cars, broken-down cars, and getting horribly lost, I have had all sorts of "adventures" on the road to Washington. Finally, the last few times I visited, I gave up driving there! But I digress. That weekend was a mess. First of all, we got lost driving in from New York that Saturday morning and trying to find RFK Stadium. We stopped at a gas station to ask for directions, but the knucklehead there never even heard of the stadium! As it turns out, we were only a few blocks away, but this was in the days before GPS on smartphones (I was still rocking a flip phone back then!) So we ended up driving to Union Station, spending $$ on parking there, and taking the Metro to the stadium. Of course, we were late to the game. But we did get to see Johnny Damon, Alex Rodriguez, and Jorge Posada all hit homers in the fifth inning, giving the Yanks a 9-2 lead. We also saw Shawn Chacon get taken out of the game in the bottom of the fifth, after having been very shaky. I remember that Joe Torre seemed extremely disgusted with Chacon. I was, too! The Nationals kept on chipping at the lead, and ended up beating the great Mariano Rivera, who made a rare eighth-inning appearance, to win the game 11-9. What a nightmare. The Sunday Yankees-Nationals game was even worse. Chien-Ming Wang was dealing, and it at first looked good for the Yankees. They were leading, 2-1, in the bottom of the ninth. But for some reason, Joe Torre decided to keep Wang in the game, even though Wang was tiring by then. I remember being positively irate that he was keeping Wang in, when it was a disaster unfolding before our eyes. And some Nationals rookie by the name of Ryan Zimmerman hit a walkoff homer in the bottom of the ninth to beat the Yankees, 3-2. And Squawker Jon gloated, of course, the whole ride back to New York. Good grief. Back to 2015. Last night, Zimmerman hit the 10th walkoff homer of his career to beat up Andrew Miller and the Yankees in extra innings, 8-6. Not only was it nauseating to see the Zimmerman and the Nationals kill the Yankees again, but the sight of Zimmerman being drenched in chocolate syrup was pretty disgusting, too. I am not a neat freak by any means, but that really creeped me out. Zimmerman had to have smelled like something out of Willy Wonka and the Chocolate Factory after having chocolate poured onto his hair. Ick! Disgusting. Even more nauseating was the injury Jacoby Ellsbury suffered last night. His going on the DL with a right knee sprain is not exactly a shock. I have been pleasantly surprised that he has stayed healthy in his 1 1/4 seasons as a Yankee, but he is an injury-prone player. He is also one of the players the Yankees really cannot afford to lose. Ellsbury leads the Yankees in batting average (.324), on-base percentage (.412), hits (48), runs (29), and stolen bases (14). He is arguably the Yankees's best all-around player this season, and has the 3rd best OBP and 10th best BA in the American League this year. So losing him, even if may only be for a few weeks, is pretty devastating. The Yankees have already lost six of their last seven games, and things have to look even more bleak. And last night's win meant that they are now tied for first place with Tampa Bay. Meanwhile, Washington now gets to share first place with...drum roll please...Squawker Jon's New York Mets. At least there is one silver lining! Heh. Should A-Rod get his buddy Warren Buffett to buy the New York Daily News? I just read the recent story in the New York Times about the potential sale of the New York Daily News. The story, by "Bronx Is Burning" author Jonathan Mahler, goes into great detail about the potential bidders for the paper, and about how much circulation has dropped. It is down to just 312,000 per day now; 25 years ago it was over a million, and when Jon and I worked there in the 2000s, it was about 750,000. I remember that number because at one point, the New York Post huge advertisement outside the old Daily News headquarters at 450 West 33rd Street, with its circulation numbers written like an odometer, showing that the Post's numbers were 652,000 and rising. The tagline? "Go ahead and stare. They’re real." This ad was visible to all of us walking to and from work, and was also able to be seen from some of the offices. Ah, those were the days of the good old tabloid wars! Unfortunately, those numbers aren't so real now, for either paper. Um, isn't that what the Internet is? Plus, purists who want to see the paper online exactly the way it looks in print can purchase the digital edition now. The News has not abandoned hard-hitting journalism; when it lands a punch, it is still felt in the corridors of power. Last year, a series on the low wages of airport workers prompted Gov. Andrew M. Cuomo to demand raises on their behalf. In more recent years, though, Mr. Zuckerman has imported a series of British-style tabloid editors to spice up the paper, which has struck some News veterans as a betrayal of its legacy. The article must have ruffled some feathers in Newsland, as the paper's gossip column had this angry response to it. At any rate, the story reminded me of an idea my friend Joe suggested -- that Alex Rodriguez get Warren Buffett, who has purchased a number of newspapers in recent years -- to purchase the paper. Heh. That would ensure that the News' relentless tone against A-Rod, the man Bill Madden once called "The Whitey Bulger of Baseball," would change bigtime! 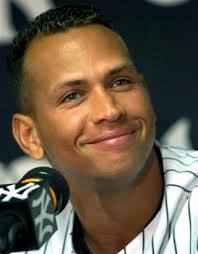 The piece that Daily News Yankee beat writer Mark Feinsand wrote on A-Rod today was really positive, though. Feinsand interviewed him talking about Bryce Harper, and it was actually a fair article. But let's face it, most of the News stuff is anti-A-Rod. I would also like to see Buffett buy the News to restore the paper to what it once was. (Helpful hint: hire people who actually read the paper!) After all, if it weren't for the News, there would be no Subway Squawkers. Not only did this blog start there on March 1, 2006, but Jon and I met at the paper. (He was my boss once upon a time and responsible for hiring me and having me move from Texas to New York in 2000!) And we had some very good times working for the Daily News. I was always proud to work there! Also, I was a newspaper junkie as a kid growing up in New Jersey, and the News was my favorite paper of all. One of my fondest memories as a child was how each Saturday night, my father would come home from work as a police officer, and bring home hot, fresh bagels and the bulldog (early) edition of the Sunday News. It was such a treat to get to read the news before everybody else. I felt that same way about getting to read the news for anyone else when I worked there. I also liked talking to legends like Bill Gallo, a truly great man. Anyhow, I wish the paper becomes a must-read tabloid again, with interesting, provocative columnists with original takes, as opposed to Mike Lupica being a one-man show, issuing banalities in both sports and news. Jon and I still have friends there, too, and we want the best for them. Hey, A-Rod -- time to nudge your buddy to open up his wallet! Or maybe you could open up your wallet -- and join your frenemy Derek Jeter in the media business! Today, May 19, 2015 is the 90th anniversary of Malcolm X's birth, the 50th anniversary of Pete Townshend writing "My Generation" (on his 20th birthday, no less!) and the 17th anniversary of the greatest baseball brawl of my lifetime -- Yankees vs. Orioles! ESPN's Buster Olney mentioned the fight fact this morning. Here is a link to GIFs showing the best part of the fight, and I have also included video of the brawl below. Graeme Lloyd and Jeff Nelson running out of the bullpen to get into the fray, with Lloyd throwing haymakers against Benitez. Darryl Strawberry proves to be the ultimate fighter. If I have to pick ballplayers for an all-star brawl team, he would be my first choice! He gets into the fight multiple times, connecting with Benitez hard. At one point, Joe Torre has to hold Straw back. Future Yankee manager Joe Girardi (!) getting into the fray. Remember that Joe? David Wells mouthing off, and being held back by Jimmy Key. Paul O'Neill (!) trying to be the voice of reason with Tino Martinez, who looks completely enraged. How the fight looks like it is starting to end, then it heats up again. How the fight spills over into the dugout multiple times. The team spirit of the Yankees -- everybody is out there in the fray! Even a very young Derek Jeter is out there! We were talking recently about Pedro Martinez throwing Don Zimmer to the ground. It still ticks me off that nobody on the Yankees did anything to Pedro over that. Not to mention the lack of response the next year (Tanyon Sturtze, the day's starter, was one of the few Yankee fighters) after the Varitek-A-Rod fight. What happened to those fighting Yankees? 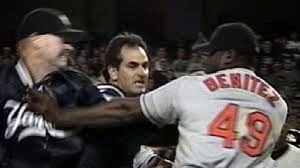 A few years ago, I heard Darryl Strawberry complain about the Yankees' lack of response in those Red Sox brawls, and how this team would not have behaved that way. I completely agree. The 1998 Yankees weren't just arguably the greatest team of all time. They were also fierce fighters! A thing like that: Why I loved, loved, loved the series finale of "Mad Men"
Stan's reaction when Peggy says she loves him. Warning -- there are "Mad Men" spoilers in this Squawk. And very little baseball talk. Be forewarned. Wow! 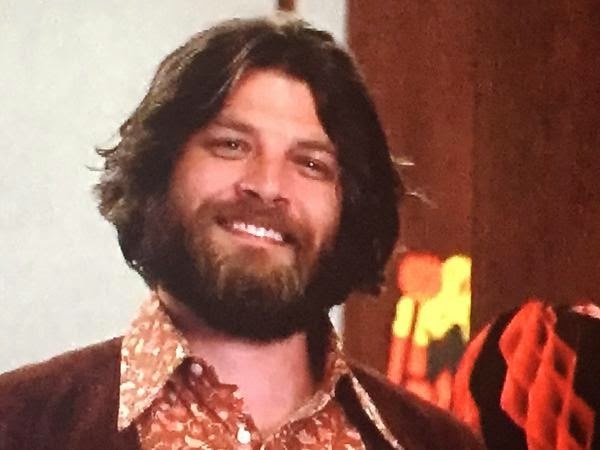 That last episode of "Mad Men" was amazing! I was worried that Matthew Weiner, a former "Sopranos" writer, was going to end the show in an ambiguous way (read: running out of ideas and not being able to come up with a real ending), the way that "The Sopranos" concluded. Instead, Weiner shocked me with a finale that was wonderful and happy and amazing. How cool is that? Pete Campbell leaves for his big job with Trudy and their daughter: I know Pete can be a jerk, but he is my favorite character on the show. That is because he is multidimensional -- he was the most progressive on civil rights and women's rights, he ended up being Don's biggest defender, and he also was very supportive of Peggy (the way he praised her in the finale just slayed me!) Pete is a little like A-Rod in doing some very bad and very good things, where he ultimately has a good heart, but acts like a knucklehead a lot. And just like Pete, A-Rod has been much better behaved this year. Steggy gets together: Yes, that is what the cool kids are calling the Stan-Peggy pairing. I was a Pete-Peggy shipper for most of the show, but I think both people ended up with the right partners. If there is any consistency to this show, it is that Peggy has consistently had awful relationships. Is there anybody on television who has had as many bad dates as she has? Only in horror shows! But in Stan, she finally has a supportive partner who understands her both intellectually and emotionally, and who wants the best for her. It was so fun to see them finally get together. I gasped when I heard Stan's speech, and cried when Peggy started talking. I have watched that scene multiple times since, and get teary-eyed each time. It was inspiring! Finally Peggy can have the career *and* the good boyfriend! They really make a terrific team. Don finds enlightenment -- and his greatest success: Squawker Jon (and a lot of other viewers) were initially confused by the Coke commercial at the end. I got its significance right away; Don would come back to McCann from his sojourn and write the most popular commercial of all time. I have had that smile on my face myself when I come up a good idea to write. Don creates the "I'd Like to Teach the World to Sing" ad, while I write about who would win in a celebrity boxing match: Pedro Martinez or Jorge Posada! But it is the same creative impulse. Of course, he gets rich from his writing, while I squawk for peanuts, but still! Some viewers seem to think that Peggy created the ad, but it was clearly meant to have been done by Don. The receptionist at the hippie center was in the ad 16 seconds in, and the hilltop in the ad looks like Big Sur. Thinking Peggy did it is wishful thinking. Some viewers also think having Don go back to advertising is somehow a failure for him. Huh? He was once great at what he did, then fell into a slump (baseball tie-in: remember his drunken singing of "Meet the Mets"?). Now he's got his groove back -- with a vengeance -- and is responsible for such a great ad. That is a happy ending to me! I work in advertising myself, and still get that frisson of excitement every time I see an ad I proofread. Imagine how Don will feel having created a national phenomenon? Plus, he seems to have reached some measure of inner peace. Good for Don! As for the other endings on the show, I can't stand Roger's new wife, but at least he seems to be happy. Plus he is stepping up to help his son. Was good to see Ken Cosgrove helping Joan. And she can do better than that controlling jerk she was dating. Plus, she will be able to be her own boss now. I was never a Betty fan, but I think the kids should be with Henry. He has raised the boys himself from an early age, hasn't he? 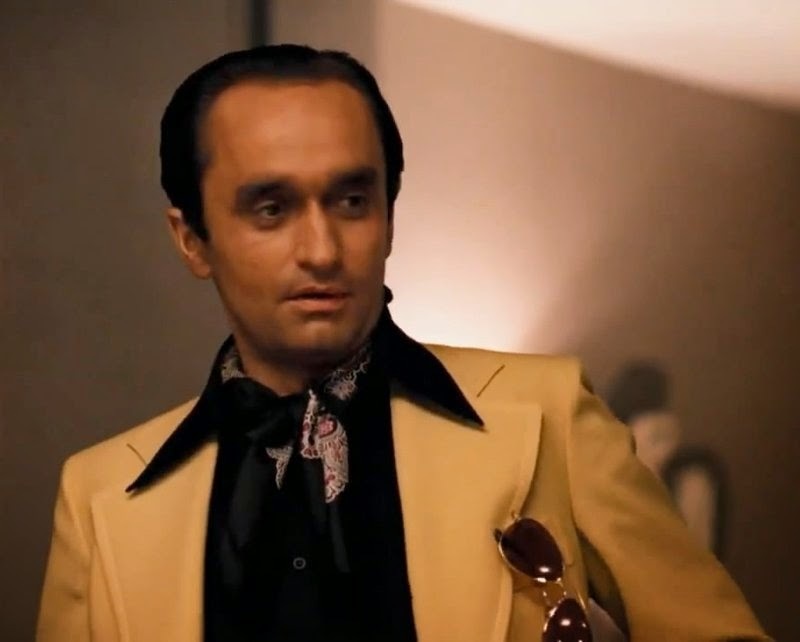 He is basically the only father Gene has really known. Betty keeping him out of the picture is too disruptive, IMHO. Harry didn't even get an ending, although he was a big character on the show in the beginning. IMHO, Harry took on the jerkitude that Pete used to be known for -- and then some -- and became a one-dimensional twit. I would have liked to have seen a Sal return -- we get endless episodes of Di the drip, and the return of Glen Bishop, but no Sal? But you can't always get what you want. In all, though, I thought the finale was arguably the greatest one of all time, with fans really getting what they wanted. Good stuff. Kudos to Matthew Weiner and the cast for pulling it off! When is the Stephen Drew Experience going to be over for the Yankees? There are many things in this world I just don't understand. Calculus. How to drive a stick shift. How to solve a Jumble. Why Brian Cashman and Joe Girardi have such faith in Stephen Drew. Why does Drew still have a job? His current numbers are .177/.264/.345. Those are the lowest numbers of any second baseman in the American League. They are also lower than any other second baseman in the majors, with the exception of Chase Utley. But at least Utley 1) has the lowest BABIP in baseball this year, making him what FiveThirtyEight.com calls "the unluckiest man in baseball," and 2) is a legendary player for the Philadelphia Phillies. Drew, on the other hand, is best known for his career with the Boston Red Sox, a career that was in the toilet last year when Cashman traded for him. I imagine that Ben Cherington and the other folks in Boston's front office are still snickering about getting the Yankees to pick up their garbage. Last year, Drew hit .176/.255/.328 for the Red Sox. His change of scenery with the Yankees did nothing to revitalize with him -- he hit .150/.219/.271 for the Yankees. I wrote in March that bringing back Drew never made any sense. Keeping him as a black hole in the lineup every day, just because Brian Cashman wants to save face after making the mistake to acquire him in the first place, makes even less sense. When is this ridiculous experiment going to be over? The Stephen Drew Experience in Yankeeland has been half a season now, and it is still not above the Mendoza line. These numbers are no longer an "aberration," as Cashman called them this spring. There is no longer the excuse that Drew started late, the way he did last year, or that he missed spring training. He had a full spring training with the Yankees this year -- which was terrible, of course. He still stinks. Joe Girardi keeps putting him in the lineup, where he, along with Sir Didi Gregorius, are disasters at the bottom of the lineup. Even though rookie Jose Pirela has been called up, he has gotten very little playing time. Granted, he hasn't been setting the world on fire in his time as a Yankee so far this year, with a .238/.238/.286 slash line. But at least he has the potential to be better than Drew. The Yankees need all the help they can get with this lineup. The only hope I have that Drew will be given his walking papers is when he starts to qualify for the potential $1.5 million in plate appearance bonuses (!) in addition to his 2015 $5 million salary (!) clogging up the payroll. Last year, when Yankee second baseman Brian Roberts got within two plate appearance of getting a bonus, he was unceremoniously given his walking papers. Unfortunately, Drew is still about 275 PAs away from the first bonus. So I am afraid we will be stuck with him for a while. Good grief. Who would win in a celebrity boxing match between Jorge Posada and Pedro Martinez? So, Jorge Posada has been in the news a lot this week, thanks to his new book, and the interviews he has done about them. The A-Rod kerfuffle regarding his remarks has been all over the news this week, so we don't need to rehash the whole thing, other than to make two quick points: Contrary to Posada's claim on Boomer and Carton that he was "cornered" into saying what he did by the interviewer, he wasn't. Just watch the clip here. Posada is the one who first brings up not just the Hall of Fame, but the 2003 MVP award! In addition, Posada's PR people aren't happy with my article on him from the other day, and shot down my request for a review copy of his book -- I wanted to put the PED references in context with the book. That is their right and prerogative, but then they can't claim I am taking things out of context, when I cannot actually see the book! Oh, well. Anyhow, I actually took the time to listen to Posada's radio interviews this week. And while I think he is awfully whiny on things like his sitdown snit, there is something I agree with him on 100%: his anger towards Pedro Martinez. I actually like Martinez, and think he is a smart guy, and one of the most interesting people in baseball, but he went too far in the 2003 ALCS against the Yankees. And he should have apologized to Don Zimmer when Zim was alive. I also thought Pedro was out of line in making fun of Posada's ears -- something he conveniently forgot to mention when he complained about Posada insulting his mother by using a certain expletive. Both of them slam each other in their respective books, and make it clear how much they still cannot stand each other. So it got me to thinking: what would happen if there were a Posada/Pedro celebrity boxing match? I posed this question to my friend Jason, who writes on boxing, and suggested he do a column on this! Withering contempt does not begin to describe his response to my writing suggestion. However, he did think Posada would open as the 3-2 favorite, due to his size, but Martinez would have the advantage in reach and ring savvy. I then posed this question on my Facebook page. Most readers said Posada would win. My friend Christopher said: "Part of what made Pedro so great was the insane flexibility his fingers had. I imagine making a fist would give him too much pain. I give the edge to Posada." He also noted: "I do give Pedro the edge against aging fighters, however; you saw what he did to Don Zimmer. He'd probably have a chance against Wilford Brimley." Ha! Longtime Squawker reader Uncle Mike sez: "If it's pro wrestling, where anything goes, Pedro wins because he fights dirty. But if it's boxing, with rules, and a referee to enforce them... It never happens, because Pedro is a coward and would never get in the ring with a real man." My friend Joe gets a blocking-the-plate dig in on Posada, saying: "All Pedro would have to do is slide at Posada and Jorge would jump out of the way. TKO, Pedro." Oh, snap! Rahsaan had the funniest line: "I would never let someone who once rocked a jheri-curl beat me in a fight. Advantage Posada." My brother Patrick thought Pedro would win, though. "Pedro would Zimmer slam him to the ground. Plus, compare throwing arms speeds for punches. Pedro hits high 90s; Posada couldn't throw out an invalid attempting to steal 2nd." As for me, I think Posada would definitely win. Take a look at Posada's brawl against Toronto's Jesse Carlson in 2009 vs. Pedro Martinez's unimpressive "fight" after Gerald Williams charged the mound. Game over. Posada will win! Now, we just need some TV network to make this match happen! Imagine simply doing your job one day when your entire life changes -- for the worse. That is what happened to Tom Ryan, a UPS delivery driver who worked on Staten Island. On Monday, April 6, he was unloading his truck at a tire store on Hylan Boulevard when a car careened into him and pinned him against his truck. The driver of the car said he was trying to avoid hitting a pedestrian, but he instead hit into Ryan. One of the UPS driver's legs was severed, and the other leg was severely injured. Since that time, Ryan has been in a medically induced coma, and is on a ventilator. Ryan is from Bayonne and has a wife and three children, age 15, 17, and 20. As you can imagine, this accident has been a nightmare for the family. So Isaac Rivera, a fellow UPS worker (and a great runner who I know from the Staten Island Athletic Club, my running club), along with some other Brothers in Brown at UPS, are trying to help the family. To that end, they came up with the idea for a 5K race to help the family. So the Tom Ryan Race for Recovery is happening this Sunday morning, May 17, at 10 a.m. in Clove Lakes Park on Staten Island, If you are interested, you can sign up tomorrow morning at the park -- admission is $20. Click here for more info. There will also be a one-mile walk, which is $10, and a free fun run for kids. Lots of good people on Staten Island are also involved in putting this event on, including SIAC, King of the Mountain Events, the Stephen Siller Tunnel to Towers Foundation, and the Brighton Kiwanis Club. I will be running the race tomorrow, and I hope there is a huge turnout. If you can't make the race, but would still like to help the Ryan family, click here for the GoFundMe page set up to help the family. I have thought a lot about Tom Ryan since his tragic accident. It is frightening to think about how his and his family's life were turned upside down through absolutely no fault of their own. But it is also uplifting to see how many people on Staten Island, especially in the running community, are trying to help the family. Runners and walkers really are some of the best people around. I discovered that again tonight when I went for a run in Great Kills Park early this evening. I was planning on doing four miles -- two miles each way -- and was having a great time. Then it started to rain when I still had a mile left, which is annoying, but it was accompanied by lightning, which is dangerous. I got a little scared, worrying about getting to my car in the lightning. Fortunately, a car of people finishing their own workout spotted me in the park and got me a ride back to my car. Whew! Greetings. I am finally back from that secure undisclosed location. Actually, I went to Austin, Texas, to visit my mother for Mother's Day. It was fun to see my mom again, and she was in great spirits and looking and feeling good. I also got to see one of my brothers, who met up with me in Austin. However, my mom still doesn't understand what a blog is, and when she heard that ESPN's Mike and Mike were getting a female co-host, she didn't like the idea of a woman taking a man's job. I was incredulous on this, and responded, "You do know I've been writing on sports for 10 years, right?" But, as my brother pointed out, our mom is 82, she has never used a computer, and she has no comprehension of this blog. (She was excited over my Guideposts magazine article, though -- print impresses her!) So I have to understand her perspective. Anyhow, speaking of perspective, some members of Patriots Nation has shown that they are delusional when it comes to defending their team. First of all, there are the morons who have decided to start a GoFundMe account to pay for the Patriots' $1 million Deflategate fine. Yes, really. 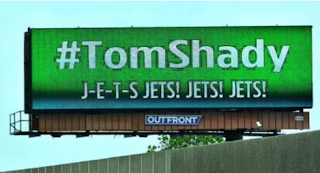 These moronic fans want to give money for a franchise worth at least $2.6 billion, owned by billionaire Robert Kraft. 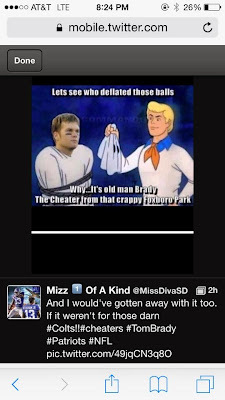 I guess it is because of the "injustice" of it all -- to wit, Tom Brady and the Patriots actually being held accountable for their cheating for once. Boo bleeding hoo. I generally don't like telling people where to spend their money. However, surely there are better things for fans to do with their dollars than to pay the (well-deserved) fines for a billion-dollar franchise. To paraphrase "A Bronx Tale," if your father can't pay the rent, go ask Robert Kraft and see what he tells you. Then there are the idiots of a sports blogging site (I refuse to link to their site or mention their site's name, as they don't deserve the publicity) who literally got themselves arrested at NFL headquarters yesterday to protest Tom Brady's suspension. These idiots now have an arrest record over their fandom. How stupid is that? Did you know that there are actually mailing lists out there of gullible people? The New York Times did a story on this a few years ago, about how con artists used such lists to target people -- especially senior citizens -- who would fall for scams. I wonder if sports-minded scammers will gather the names of everybody who donated money to the Patriots, and everybody who got arrested on the team's behalf, and target them for shenanigans. Would serve them right for their stupidity. Of course, nobody as of yet seems to have done anything to help John Jastremski and James McNally, the two Patriots employees who have effectively lost their jobs, and had their lives ruined, due to following Tom Brady's orders. Shocker. I wouldn't pay for this, either, but at least it is funny. Yet Patriots Nation wants to believe this is all a witch hunt, and it is all because "they hate us because they ain't us," as one of their moronic slogans goes. And Kraft whines that the case "was based completely on circumstantial rather than hard or conclusive evidence." Um, Bob? Hate to tell you this, but circumstantial evidence is both hard and conclusive evidence. You know, like how circumstantial evidence put your old tight end Aaron Hernandez behind bars for life for murder. P.S. You are not getting that NFL apology you so arrogantly demanded. Tom Brady, along with Peyton Manning, got NFL rules changed in 2006 to allow NFL teams to prepare their own footballs both at home and away. "Before that rule took effect, in Brady's five seasons as a full-time starter, only once did he throw for as many as 4,000 yards, and never did he throw as many as 30 touchdown passes. But after that rule change, he became the statistics monster that he remains today, throwing for more than 4,000 yards in six of the ensuing eight seasons, with at least 30 touchdown passes in five of those years." Coincidence? I grew up in Jersey. I don't believe in coincidences. The Wells Report says that the cheating was not just in the 2014 season. Given these statistical changes, Brady may have been getting away with cheating for many years. Spygate, Deflategate, multiple murders -- these are your New England Patriots. In addition, Brady refused to provide the texts, emails, etc. he was asked to, "despite being offered extraordinary safeguards by the investigators to protect unrelated personal information." Just this failure to cooperate alone is enough to subject him to disciplinary action. 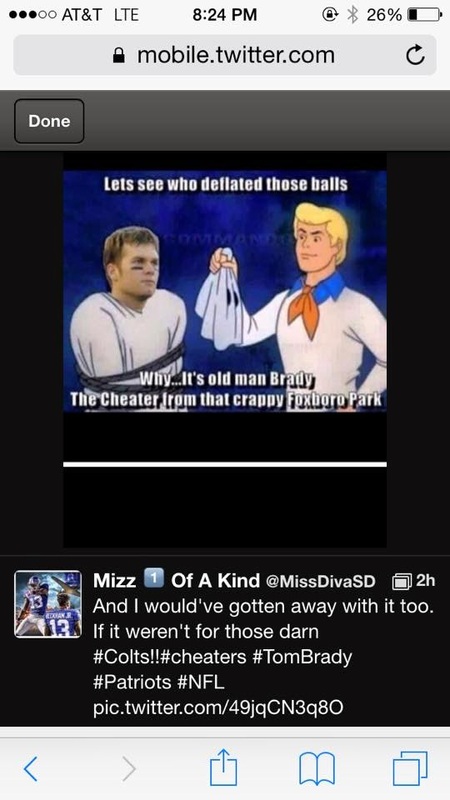 Anyhow, I am pretty gleeful to see a world-class phony like Tom Brady get his comeuppance. I only wish the suspension was longer! After Noah Syndergaard pitched five scoreless innings in his major-league debut before allowing three runs in the sixth and losing to the Cubs, the media wondered if he had been rattled by Daniel Murphy failing to throw out Kris Bryant in the third. Actually, Syndergaard got out of that inning, even though he had to throw an additional 18 pitches. If anything rattled Thor, it might have been the realization that he might have to throw a shutout to have a chance at winning. The Mets are last in the National League in runs scored and batting average since April 24. I hope it's a coincidence that I attended my first game this season on April 24 when Squawker Lisa and I went to the Subway Series opener. The Mets were 13-3 going into that game and have lost ten of 17 games since. Tonight was similar to the April 24 game, as well as the other game I've been to, the May 2 1-0 loss to Washington, in that the Mets were not only punchless, but barely had any chances to score. Tonight they had five hits, but none for extra bases. Worst of all, they blew a chance to start a rally when Curtis Granderson tried to go from first to third on a single when he had no chance and made the dreaded first out at third. It's great to have Thor joining the Dark Knight in the rotation (and shouldn't Bartolo Colon be the Incredible Hulk? ), but all the pitching in the world won't make up for a team that can't hit. I can't help but revisit the offseason, when Sanday Alderson bolstered the hitting by signing Michael Cuddyer, now hitting .241 with a .684 OPS, and John Mayberry, whose .103 batting average is worse that that of Jon Niese, Jacob deGrom and Dillon Gee. When it comes to players like Mayberry and Kirk Nieuwenhuis (.111), no wonder the pitchers are batting eighth. At least Syndergaard had a better time of it than another Met phenom who made his major-league debut at Wrigley Field. Tim Leary lasted only two innings in that April 1981 start before hurting his elbow. He would not pitch again in the majors until September 1983. Is Don Draper a man in a hurry? How a "Mad Men" episode echoes "The Andy Griffith Show"
From last night's episode of "Mad Men"
Okay, let’s get to it. AMC’s “Mad Men” is ending its run next week, and there were three main storylines in “The Milk and Honey Route,” last night’s episode, which involved Don, Betty, and Pete, three of the main characters. This was one of the best episodes of the entire series, IMHO. 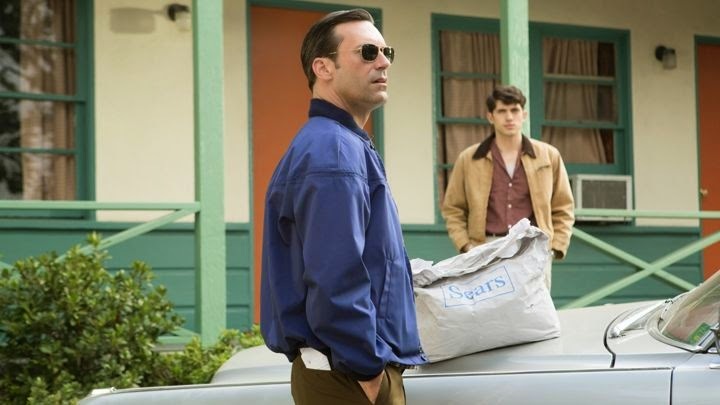 “Mad Men,” which was once a really great show, had really gone down in quality over the last few years, which made last night’s terrific episode one worth savoring. Some TV fans got into “Mad Men” from the beginning of the show. As for myself, even though Squawker Jon told me it was the best program on TV, I didn’t start watching it until I started working in advertising, and then I binge-watched and got caught up with the show a few years ago. Anyhow, what I want to talk about is the “Mad Men” plotline involving Don Draper, the show’s main character. He is on a sojourn across the country, driving hither and yon after walking out of an advertising meeting and hitting the road. (Speaking of which, I am on a sojourn on my own, but will be back soon!) Don is on his way to the Grand Canyon, but ends up in Alva, Oklahoma after his Cadillac breaks down. He has to stay in this small town while his car gets fixed, which takes longer due to some parts having to get shipped in. A "Man in a Hurry"
Longtime Squawkers readers know that "The Andy Griffith Show" is my favorite show of all time. 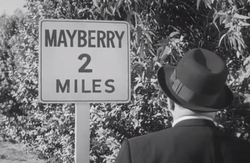 In the “Man in a Hurry” episode of “The Andy Griffith Show,” which is arguably the most famous episode of the program (and the quintessential one to watch if you want to get the appeal of the show), Malcolm Tucker is a city slicker from Charlotte on his way to a meeting. But his car breaks down in Mayberry, North Carolina on a Sunday and he has to stay around while his car gets fixed. The businessman is increasingly exasperated by the slow pace and minutia of Mayberry. He doesn’t want to hear two old ladies using the telephone party line to talk about their aching feet, or to hear about Barney Fife talk about taking a nap and going over to Thelma Lou’s to watch a little TV. He can’t understand why Wally, the owner of the filling station, won’t work on Sundays, and he thinks Gomer Pyle, who pumps gas at Wally’s, is a doofus. But then Tucker gets charmed by the small town niceties – Andy singing and strumming a gospel song on the porch, Aunt Bee making him a sack lunch, Opie giving him a penny that was run over by a train. Even though his car finally gets fixed that day, Tucker makes an excuse to stay another day in Mayberry. In the last scene, Tucker is fast asleep on Andy's porch in a rocking chair, his surrender to the simpler life complete. On “Mad Men,” the small town featured on the show seems at first like a wholesome scene as well, although Draper is not as cranky as the businessman on “The Andy Griffith Show.” Don checks into a mom-and-pop motel in Oklahoma, where he gets offered a leftover roast and helps fix a typewriter. It looks at first like Don is going to learn about how wholesome small-town Okie life is, as opposed to the venal people in the big city. But instead of an uplifting “Don learns the true meaning of life” plotline, the way “Man in a Hurry” ended, the “Mad Men” plotline veers in a different direction. But after Draper goes back to the motel, the evening takes a turn for the worse when the $500 meant for the veteran goes missing, and everybody thinks Don did it. (Although if the look on the female motel owner’s face is any indication, she seems to believe in Don’s innocence.) The vets and the male hotel owner beat up Don to get the money back, and even hit him in the face with a phone book. It is pretty horrible to watch. Don figures out what really happened – the male maid took the money. He readily cops to it, justifying it by saying that the vet burned his own house down. Don exhorts him to give back the money, and tries to convince the young man to get off the bad path he is on. Draper ends up getting the money back and leaving it to the motel without explaining what happened. He also agrees to give the con artist a lift to the bus station – the guy is skipping town. But then, when they get to the bus station, Draper gives the guy the Cadillac to keep, and goes to wait for the bus himself. We won’t find out where Don is going to until next week, but I imagine that small-town life is not going to be where he stays. Anyhow, it seems to me that Matthew Weiner, creator of “Mad Men,” deliberately chose this plotline to echo “The Andy Griffith Show” one. Incidentally, "Mad Men" has shown characters watching "TAGS," which aired in the show's timeframe. But in all the recaps I have read, nobody else has made this comparison of the plot points! So if nobody else would write it, I guess this job falls to me!